The black Ruby Barb comes from forest streams in Sri Lanka. They are usually found at an elevation of around 1000 ft. Your should keep this little guy in a group of six or more because he likes to school with his buddies in the middle of the tank. Provide them a good amount of lateral swimming room to fully appreciate their fast swimming. They also like to have tall plants for cover. A darker substrate will showcase their colors very well. This is a wonderful community fish that does not nip fins like other barbs. In groups of six or more they will school and provide you a beautiful group of colorful little friends. 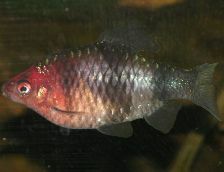 Groups of Black Ruby Barb should consist of more females than males for maximum happiness. Males have deeper, more vivid colors. When spawning, males develop a bright red body and red tail fin. Males also have reddish pectoral fins. Black Ruby Barbs are peaceful school swimmers. They will school with similar size and color fish not of their species, such as the Black Skirt Tetra. These little monsters are vigorous feeders and will happily attack any food you put in the water. To breed this little friend, a seperate tank should be used and filled to 1/4 capacity. Your should plant some semi-aquatic plants for the spawning activity. The females will lay 100-200 eggs in the leaves of the plants. After spawning activity stops, you should remove the adults as they love to eat the eggs. The eggs hatch in 1-2 days and the fry are free swimming 24 hours later. The fry will eat baby brine shrimp and crushed flake food. You must maintain excellent water quality until they reach a juvenile size. For more details, see Wikipedia's Black Ruby Barb page.